Rookie Round Up with Rick Guthrie at Keller Williams Fairfax Gateway office. Rookie Round Up covers all the essentials of navigating the real estate world. Rick Guthrie teaches different topics each week to help new agents learn the ins and outs of real estate to help make new agents the most educated, and knowledgeable agent you can be. If you are interested in attending this program or others like it please contact the Keller Williams Fairfax Gateway office in Fairfax, Virginia at this link for more information. Keller Williams is known for their extensive options and coverage of topics when it comes to training. Keller Williams was awarded the #2 training company in the United States and the only real estate company to make the list. Come meet with Rick and the other amazing trainers at Keller Williams Fairfax Gateway, to kick start your real estate career today! Knowledge is power! The Sold Summary for February 2014 is not only interesting but encouraging even with the unusual inclement weather that we’re not use to seeing here in Fairfax County Virginia. 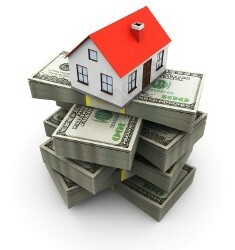 The sold residential real-estate dollar volume was $394,314,537 that’s up by 7% from last year at this time. The average sold price was $499,765 again up from the average sold price of $476,735 from February of 2013. Fairfax County real estate units sold increased by 2.07% totaling 789. This is all great news for Fairfax County Real-estate. The number of active Fairfax County real-estate listings in February 2014 was 1,814 that’s up by more than 26.32% with the average days on the market just at 60 days. It’s up and Rick Guthrie says, “That’s no Snow Job”. Rick Guthrie, Team Leader for Keller Williams Fairfax Gateway, discusses real estate trends for February 2014 for Fairfax County Virginia and Northern Virginia. How did the massive amount of snowfall this winter have an impact on real estate sales in the Fairfax County, Virginia area. Each month Rick Guthrie will have these trends so come back for more details, also for more articles like this and to see what else Keller Williams Fairfax Gateway has to offer check out Rick’s vlogs at the link below. Rick is always looking for talented agents if you would like to contact him please go to the contact rick link above. Coaching, consulting and training real-estate agents in Northern Virginia always unveils similarities, in agents, that seem to prevent them from realizing their true productivity potential. I’ve found the secret to more clients is simply not to keep what you do a secret. You may have heard it said, “Don’t be a secret agent” yet many of you are just that. Secret agents in real estate agents just don’t lead to a successful business. In your social, familiar and recreational environments you’re a secret agent. No one knows you’re a Real-estate professional what company you’re partnered with and what you specialize in. Ask yourself this, “which Real-estate agent would I recommend to my friends, family, neighbors and close acquaintances?” Then before you answer realize this; the only person’s real heart felt motivations you know of are your own. You’re not pushy your just the best for your sphere. So don’t keep it a secret. Here are my 007 ways to keep you from being a secret agent. Make sure you include a real-estate phrase in your home voice mail and email signatures. Start a Business professionals group. Start with 5-10 in different occupations. Lawyer, doctor, landscaper, insurance professional, Realtor® (you), restaurateur just to name a few. Meet monthly, each taking a topic around their profession and speaking to the group. Host a community garage sale. Go door to door and introduce yourself handing out a flyer describing the event. Have them email you if they want to participate. Advertise the garage sale weekend then walk the subdivision on the day of the event and say hi! Organize a community clean up or playground restoration event. Contribution is good for everyone including you. Sellers take interest in agents who take an interest. Sponsor a local youth sports team. Make sure you’re at the games cheering them on. Kids love snacks after the game. Talk with the coach and parents to offer any help. Now I’m sure you can think of more. Maybe 009 or 025. The point is, never be a “Secret Agent” again. Everyone should know who you are and what you do. You know how James Bond is always aware of his environment and surroundings? You need to be aware of yours too. Listen for those conversations that involve investments and real-estate. Guess what? You speak that language. Offer up your expertise. Be the Northern Virginia Real-estate go to person. Be the one that your sphere will ask professional advice from. But first they have to be reminded over and over that Real-estate is what you do. Real estate industry giant Keller Williams reported record growth, productivity and profitability gains for 2013. Already the largest real estate franchise by agent count in North America, the company added 15,000 associates last year, bringing its overall associate count above 95,000. The extraordinary productivity gains drove profitability for franchise owners and fueled historic Profit Share distributions to associates. Ninety-five percent of offices were profitable for the year – a figure far above the standard for franchise businesses. The company shared more than $78 million with associates through its Profit Share program – an increase of 41 percent over 2012. Since the program’s inception in 1996, the company has distributed $475 million in profits with associates. It is on pace to double that cumulative Profit Share to more than $1 billion over the next five years. Signing master franchise agreements covering Austria, Germany, Switzerland, Turkey and the UK and celebrating the launch of KW Indonesia, KW Southern Africa and KW Vietnam. Being named the #2 training organization across all industries by Training Magazine. Reaching No. 1 on the Wall Street Journal business bestseller list with co-founder Gary Keller’s The ONE Thing, which has now been translated into 23 languages. Launching a mobile search app individually branded for associates and holding a consumer sweepstakes that will give $50,000 to a consumer who downloads the Keller Williams Real Estate Search App. During an update on the company’s global expansion, Keller Williams Worldwide President Chris Heller announced plans to open Keller Williams offices in Dubai. He also welcomed more than 130 guests from 24 countries. Keller Williams President Mary Tennant shared that the company’s charitable foundation, KW Cares, had awarded more than $2.5 million in grants in 2013 to Keller Williams associates and family members struggling against unexpected hardships – from health issues to natural disasters, such as tornados in Oklahoma and flooding in Colorado. Keller Williams Realty, Inc. is the largest real estate franchise company in North America, with approximately 700 offices and 95,000 associates in more than a dozen countries around the world. The company has grown exponentially since the opening of the first Keller Williams Realty office in 1983, and continues to cultivate an agent-centric, education-based, technology-driven culture that rewards associates as stakeholders. The company also provides specialized agents in luxury homes and commercial real estate properties. For more information or to search for homes for sale visit Keller Williams Realty online at (www.kw.com). For more information about KWWorldwide, please visit kwworldwide.com. Our dream homes are often inspired by our own imaginations, from the homes we see in our own neighborhoods or the perfectly designed interiors we see in magazines. However, sometimes our dream homes can be seen on a much larger scale, operating as the home to some our favorite movie stars. Check out these five amazing movie houses that film buffs commonly lust after! In the hilarious romantic comedy The Proposal featuring Ryan Reynolds and Sandra Bullock, a gorgeous waterfront house acts as Ryan’s family house in Sitka, Alaska, nestled at the base of the mountains and featuring a pull-up-by-boat-only dock. Though this house is just as incredible as it was portrayed in the film, its physical location is actually in Manchester, Massachusetts. The mountains were added using special effects, however, this natural stone house is just as lovely as seen in the movie. The real thing is much more colonial in style, though, and much of the interior as seen in the film was created with a facade to create a more rustic feel. Who doesn’t fantasize about throwing lavish parties in the castle-like mansion that played as Leonardo DiCaprio’s home in The Great Gatsby? Just as it might have been suspected, most of this castle is like something out of fantasy. This house features an intricate pool, a two-story master bedroom, an incredible library with a winding staircase, and a grand ballroom. 42 different sets were built in Sydney to piece together this ultimate fantasy house. Actually existing in real life is the magnificent house that was used as the Cullen house in the vampire movie Twilight. 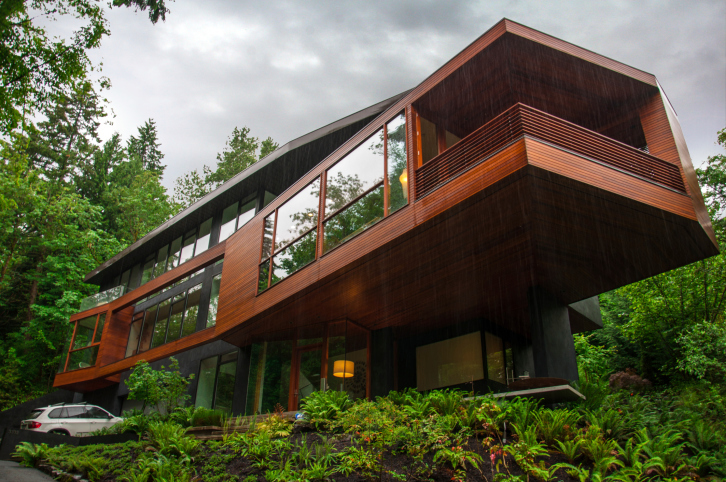 As a contemporary, ultra-modern log house – if you can call it that – the Cullen house drops jaws with its floor-to-ceiling windows that open it to its natural, woodsy surroundings. The contemporary and beautifully designed interior is just as jaw-dropping, which was all completed in 2007 – just in time to make it to the big screen. When Carrie walks into her soon-to-be apartment and exclaims “I think I’ve died and gone to real estate heaven!” we know that many of the women (and men) in the audience agreed. Many of the interior sets were shot at Silvercup Studios in Queens, including the incredible entry and heavenly closet that Big builds for Carrie. Still, real or not, there’s no reason why you can’t aspire to reach this level of real estate heaven or own the closet of your dreams. The movie that can never be forgotten, which sparked Brad Pitt and Angelina Jolie’s controversial – and lasting – relationship, is also one that presents a traditional American home that many lust after. The house that plays as the family home to Mr. and Mrs. Smith resides in Pasadena, California, and offers many modern and contemporary design features. The home has many glass chandeliers, all of which are eventually destroyed in the characters’ “falling out.” Still, this movie house is a great source of inspiration for interior designers everywhere. Wherever you get your inspiration from for your perfect dream house, knowing it’s a possibility is the most important thing. With your real estate agent on the lookout for you, it’s not only a possibility, it’s a high probability! Don’t wait any longer; contact a real estate agent today to find a piece of real real estate that will make you feel like a movie star.